V15, Rick Willoughby's new boat tested! End of the Road or New Beginning? Glorious sunny day at lake Cavazzo, our usual testing site. It is a small lake in North-eastern Italy, not far from the Austrian border (well, no-border, we are the European Union now...). There is also a monster in the lake, but it didn't show up. A bit windy at first, then flat water. 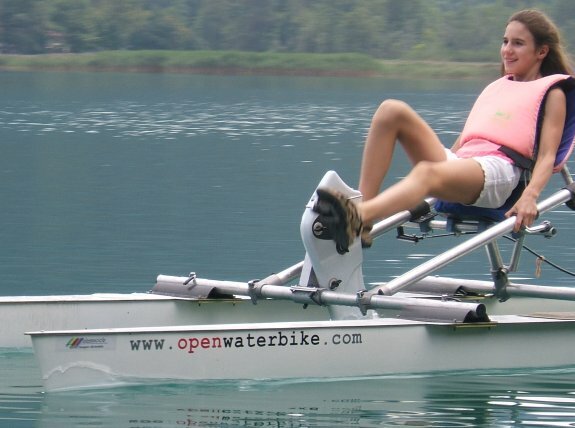 Actually, we were not not about testing performances, just user-friendliness, the perception of safety by common people, the sheer pleasure of waterbiking. Several people tried the boat, most of them ladies and children. The registered speed (GPS) range was from 5 to 7.5 knots , as expected. Cruise speed seems to be 5 to 6 knots for most people. We discovered that ducks are not afraid of the waterbike, and the children just loved that. Please enjoy the videos and feel free to give us your feedback!